Compact, lightweight and robust – the R40B is the perfect solution for smaller gardens. The powerful battery pack means no fumes, less noise – and no local emissions. 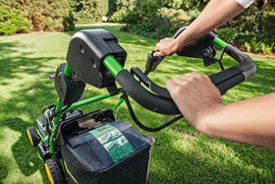 Our battery mowers are precision-engineered in Germany for years of trouble free service. Li-Ion batteries offer full power from the start. 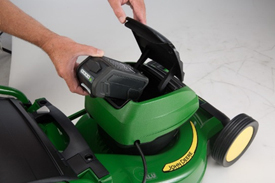 The batteries used on these mowers offer competitive 4Ah which allows ~20 minutes of mowing in normal applications. While this is enough for 280 m² (3013 sq ft) (R40B) respective 320 m² (3444 sq ft) (R43B), owners of larger gardens can purchase a second battery. 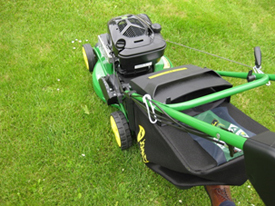 The mowing deck allows mowing to the edge, thus eliminating the need to tidy up edges with a trimmer. Use the left side of the mower for the cleanup path; it gets closer to the edge than the right side due to the discharge chute on the right. 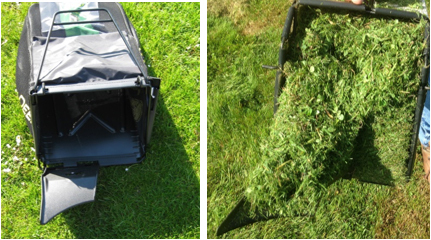 The durable and attractive rear-discharge bag makes grass collection easy. The bag design allows installation and removal in seconds. The large mouth and the molded in grip at the underside makes dumping grass clippings easy. Textile baggers limit dust accumulation while plastic bags with their larger openings allow dust to exit easier. A fill indicator signals the operator when it is time to empty the bag. Bags are colored black to keep looking clean. No grass falls down when taking the bagger out (operators will appreciate this especially in parks where people walk their dogs: having pushed back the grass from the discharge chute manually into the bagger is usually a steep learning curve). Compared to a plastic bag, the textile bagger does not open when going up steps e.g., between patio and garden: the rear of the bag will be pushed up by contacting ground, but the flexible textile bag remains on the mower. A plastic bag will be completely pushed up at the rear, resulting in grass dumping. Operating elements are color coded for intuitive operation as on any John Deere machine: orange elements are for drive (variable-speed control in case of Walk-Behind Mowers); yellow elements control the implement (the blade). Handlebar allows the operator to rest hands comfortably during operation. All main elements are within reach.